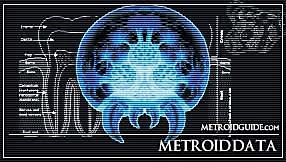 The Gamma metroid is the result of molting from the Alpha metroid. Compared to the Alpha metroid, the Gamma is a monster. Thru this new molting, it has gained a considerable amount of bio mass. Gamma Metroids are almost twice the size of Alpha Metroids. Gamma Metroids differ from the Alpha in the fact that they have grown an extra sheath of outer carapace. The carapace is hard enough to withstand lava and other environmental hazards found naturally on planet SR388. The Gamma has an extra-extended appendage length. Since their last molting, the length of their appendages increases considerably. The hind most appendages begin to curve, forming at a "knee" joint. The upper appendages located upon their torso now are more maneuverable, able to grasp and take full advantage of their environment. The Gamma sees through a heightened visual system, consisting of eight multifaceted eyes. Their brain cavity has also increased in capacity. 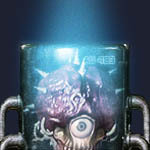 Gamma's, unlike the Alphas, are very remotely located, and prefer to be left alone from other Metroids. Gammas, being solitary, have learned to become very territorial. They guard their domains very jealously. 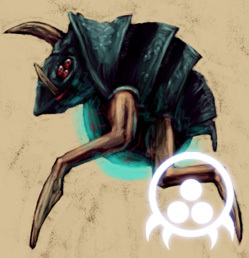 Using their defensive top horn, they carve massive caverns out of the indigenous rock to form their caves underground. Gamma Metroids have been noticed that while hunting prey, they can emit a quick beam of static energy towards prey. This static beam will temporarily immobilize prey, allowing it to attack at its leisure. Because of their immense size, Gamma Metroids are always constantly on the move to fulfill their rather quick metabolisms. For this very fact, it would be an estimated 200 hosts more until they have gained enough energy to molt once more. If food is scarce in the area, then it will not be as easy to develop as another Gamma in an area abundant with food.